But when will the UK be switched on to HD? Sky has announced that its Sky + HD box is now available for just £75 in October, as it launches its raft of new high definition channels. BSkyB already boast the most diverse HD service on the market, and the addition of seven more dedicated channels will bring the total up to 26. With new competition from Freesat – which announced that it had reached 100,000 sales - Sky is keen to keep hold of its 10 million subscribers. The £75 offer is available to both current subscribers and new customers, although current customers without multi-room will have to pay £30 installation fee. It's the latest play by the company to boost HD viewing in the UK – with uptake still slower than projected despite the huge increase in HD Ready televisions. Sky currently has just less than 500,000 HD customers, and although Freesat offers free-to-air HD the only other competitor is Virgin Media, which offers far fewer HD channels but a more extensive HD on demand service. All of the broadcasters appear to fear that a section of the public is not aware that they must have a high-definition source to be able to watch HD, and not just an HD Ready television. 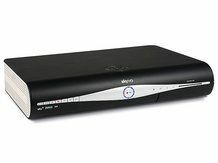 Without an HD decoder, television pictures will display in standard definition – although the arrival of HD services on Freeview may well help the public's education in this area.